This delightful design was created by the firm, Blank known for their detailed Blumenkinder, or flower children. Christine Blank's style usually depicts the flower girls in Faltenrock or pleated skirts. 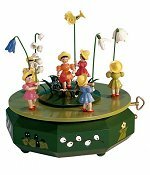 36 Note Swiss movement - Reuge plays Tchaikovsky's "Waltz of the Flowers"
Some of these individual Blumenkinder are available: Blank Flower Children. 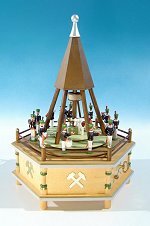 This super detailed, large music box depicts a historical Miner's band circling a Lift from the 1850 era in the Ore Mountains of Saxony, Germany. Created by the firm of Volker & Heiko Flath, they are located in the small village of Seiffen in the Ore Mountains in the heart of this former mining region. Made in Germany by Volker & Heiko Flath Seiffen - Erzgebirge 12-5/8 inches - 32,0 cm in height 9-1/4 inches - 23,5 cm in Width 28 Note Reuge Swiss movement plays... "Glück auf, Glück auf"